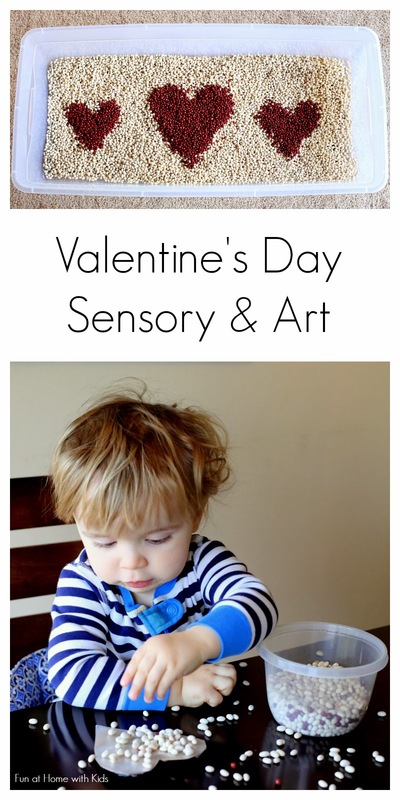 We've had so much fun playing and making art leading up to Valentine's Day. We are big on sensory play, so when I found these at the grocery store, I just knew I wanted to set something fun up for the kids. I had so much fun making the pretty little hearts. Happy babies! You can set a splat mat or sheet down if you're worried about spilling. I usually don't with dry stuff because it only takes 1-2 minutes to scoop it all up. One of S's favorite ways to play was to make a pouch full of beans and DUMP! X enjoyed watching the beans fall from inside and outside the bin. When the kids had had their fill of the sensory play, we moved on to art. I made sticky hearts (you can find complete directions for making sticky hearts in our Tissue Paper Hearts post) again and set the kiddos up with a small container full of beans. S very carefully created a cute little face on her heart (you can see her working on the smile here). Little guy with his finished heart! He was so proud that he made a heart just like his sister! To make the bin I used dry Red Adzuki Beans and dry Small White Navy Beans . Dried beans are one of our favorite sensory materials. Super fun and they last basically forever (so long as you keep them dry!). If you enjoyed this post, be sure to check out the rest of our Valentine's Day posts here! Follow along with Fun at Home with Kids on Facebook, Google+, Pinterest or Subscribe by Email or Bloglovin'! All activities here are activities I feel are safe for my own children. As your child's parents/guardians, you will need to decide what you feel is safe for your family. I always encourage contacting your child's pediatrician for guidance if you are not sure about the safety/age appropriateness of an activity. All activities on this blog are intended to be performed with adult supervision. Appropriate and reasonable caution should be used when activities call for the use of materials that could potentially be harmful, such as scissors, or items that could present a choking risk (small items), or a drowning risk (water activities), and with introducing a new food/ingredient to a child (allergies). Observe caution and safety at all times. The author and blog disclaim liability for any damage, mishap, or injury that may occur from engaging in any of these activities on this blog. This looks like some fun art and sensory play! I love how you made hearts with the beans in the sensory bin - I don't think I would have had the patience for that! So pretty as an invitation, Asia! My 2 yo is over my shoulder as I was looking at this post " MOM!! Mom!!" "Yes?" "Mom, that is a lot of beans! !, That's a lot of beans." I can hear his glee from here :) Super cute! Click here to read more about us!